Four months into the siege of Leningrad, the city is starving. Seventeen-year-old Lev fears for his life when he is arrested for looting the body of a dead German paratrooper, while his charismatic cellmate, Kolya, a handsome young soldier arrested for desertion, seems bizarrely unafraid. Dawn brings, instead of an execution squad, an impossible challenge. Lev and Kolya can find a dozen eggs for an NKVD colonel to use for his daughter's wedding cake, and live. Or fail, and die. In the depths of the coldest winter in history, through a city cut off from all supplies and suffering appalling deprivation, man and boy embark on an absurd hunt. Their search will take them through desolate, lawless Leningrad and the devastated countryside surrounding it, in the captivating journey of two men trying to survive against desperate odds. This was a great book, the language flowed and he has real talent. He also writes screenplays, and I have seen the movies but I can say I like this book better. 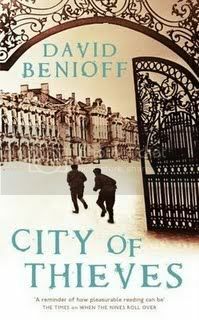 The book takes place during the siege of Leningrad (St Petersburg), young Lev gets caught stealing from a dead German and brought to prison. There he and another man, a deserter gets a choice, bring him 12 eggs and they will get back their freedom. Not the easiest thing to do since the siege has lasted for a long time and there is nothing to find in the entire city. Only one thing to do, leave the city. This book has it all cannibals, the horrors and brutality of wars, the civilians who suffer, and those who just try to get by. It is not really a tale about war. Since it focus on the hunting for the eggs, but while they hunt they see all these things. What the war has done to the people of the city and those behind enemy lines. The truth is always horrible. I like Lev, he wants to survive, and being Jewish does not help later on. Kolya boasts about everything, women, his knowledge, and he also complains about not having gone to the bathroom for 9 days. They are a odd couple, and Kolya is trying to learn his little friend a thing or two about women. It is a captivating story, great characters, and they are not entirely caught up in the whole propaganda machine. The book was researched and he captured the country. Not to mention he managed to make it less horrible too, they could still smile about things and that sure helped the reader too. I do not think I have ever read a book about the "enemy", since when I think about those years I think about the 2 wars we fought against the Russians. Since they and the Germans had divided up Europe between them and tried to take everything they could. And we who were on the side the Russian wanted were the only ones to so to say get away. And we were mentioned too. Of course they had to mention the knives, honestly even I think about Finns like that. I also learnt something new, did not know we had the worlds best sniper. Funny that, learning something new about your own history. He sure did his homwork. Wow, this sounds great! I've never heard of it, so I'm glad you brought it to my attention. A great cover, I agree. Thanks for your great prospective. Glad you enjoyed it. I like books like this - true to life, and about a period I will never know, and thankfully never experience. With all our knowledge, their is still so much to learn. Sounds like a wonderful book, but too "heavy" for me. I tend to avoid books that take place during war times. Cannibals - don't think that I have come across these in a book before. I am not sure it is one for me, but I love the cover. Excellent review!! I loved this book too and thought the author wrote wonderfully!! I think it is the UK one, this other one I found online was not as good. But yes do not judge a book by its cover. Great book, it had me at once. I am so grateful for that too, that siege was horrible. They even ate all the cats and dogs. But good to read about it and know. It wasn't actually that heavy, he took this light-hearted tone to it all. And that was good cos it could have been so heavy. Yup they ate all the food, then the cats and dogs, then someone might have thought what about humans...gross really. But awesome book. Fantastic review, going to put this one on my wishlist as I havent read one about Russia in a while and it sounds like you really enjoyed it. oh, I loved this book! Thanks for your great review. I love your perspective on it as a Finn and a European; the American POV is so different sometimes- thank you for that! The cover is beautiful of course. The story inside sounds very interesting, and I always like to read and learn a little history along the way. Thanks B! This sounds fascinating. I love books that are engaging and teach you something new. I've had this on my to-read list for awhile. I hope it's okay that I linked to your review on War Through the Generations. Do read it, it was really good, and great flowing language. This sounds so good. Your review really made me want to read it. Thanks for sharing it with us. It must have been interesting to read about a past that was so close to home. Here in the States, wars seem after away, until it was brought home to us. We've never actually fought a war within our own borders against an outside enemy in over 100 years. The Mexican War is about it, during in the 1800's and it was confined to Texas, where it was actually a squabble over whom the Texas territory belonged to. We fortune in that respect. All of Europe has seen horrendous battles that have left many scars. It sounds like an excellent book, something that needs to be read. Thanks for a great review and for bring it to my attention. You have sure been the lucky ones, all of Europe has sadly been affected. No longer only on the battlefields, but war brought into every home. I really do not I would be brave to live through those times.